When people first find out that I’m a hooper, I often get asked why I do it. Is it for exercise? Do I compete in dance competitions? When I tell them no to both, they often give me a confused look, and that is when I tell them I do it for fun. While that is the truth, I don’t often get the chance to talk about the deeper reasons why I hoop. Hooping has taught me many lessons, this practice, just like yoga, will never be complete and I’m happy to keep learning. Here are a few lessons that have helped me light up my life! Lesson #1 – What goes up must come down – unless you choose to keep it up! Whether hand hooping above my head or hooping on my chest, gravity seems to want to pull the hoop down to the ground. It takes a lot of effort to keep the hoop up. I think of the hoop like my mood or happiness level, it rises, it falls and it takes work to keep it up. I have the choice to keep working to be happy, or the choice to let whatever wants to bring me down take over and stay stuck in that mind frame. I know it’s not always as easy as just flicking a switch to be happy, but there are things you can do to help yourself. Playing in my hoop for a few minutes is enough to shake up my energy so I can move through whatever is bugging me. I’ve written about the power of movement before and how much movement can alter your mood, it’s pretty amazing actually. I’m not 100% happy all the time, and that’s OK, but hooping reminds me to make the choice to be positive. 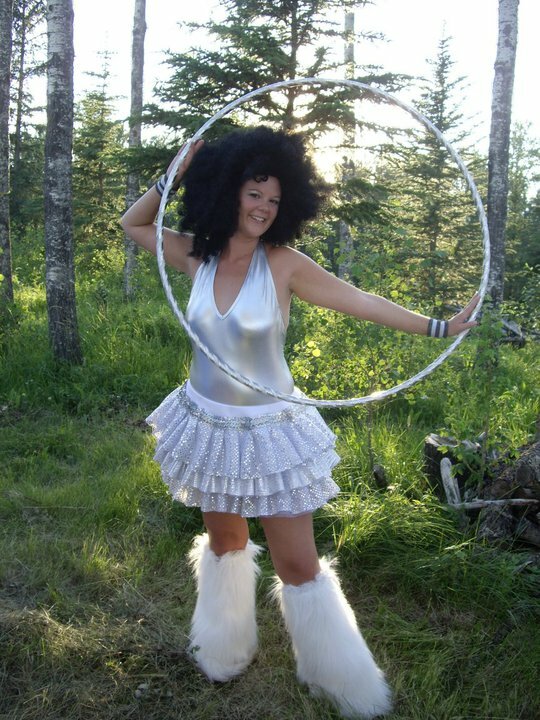 Lesson #2 – It’s never appropriate for a lady to thrust her hips in the air in public – unless she has a hoola hoop around her waist, then it’s OK! Lesson #3 – Being yourself is incredibly awesome! Think about your favourite hooper. You might like their style because they have awesome flow or they have a funky spin on a popular trick. You might try their move out for yourself but find you just don’t feel as good doing it as they look. Philo of hooping.org pointed this out to me and I completely agree – what you’re admiring is that person owning who they are and expressing their inner awesomness, it’s not just their fancy moves or funky style. You are never going to look as awesome trying to imitate someone else as you will by simply being yourself. It takes confidence to be ourselves and that is what we’re attracted to in others. Maybe you’re not there yet, but you can fake it until you make it. If you catch yourself saying you’re not as good as someone else, just stop and re-frame that thought to be something like “that person is awesome, and I am awesome too!” Our thoughts become our reality, so if you keep thinking you’re awesome (and you are! ), you’ll start believing you’re awesome (because you are!) and in no time at all you will start radiating the awesomeness that was always inside of you. How awesome is that?!?! This entry was posted in hooping, inspiration, life and tagged awesome, health, hooping, life lessons, mental-health by rosehiphoopdance. Bookmark the permalink.